Kotta alluḍu / Koḍavaṭigaṇṭi Kuṭumbarāvu. Vijayavāḍa : Navōdaya Pabliṣarsu, 1962. From the University of Chicago Library. కొత్త అల్లుడు Kotta Alludu (The New Law) by కొడవటిగంటి కుటుంఒరావు Kodavatiganti Kutumba Rao. Kodavatiganti Kutumba Rao was a novelist, journalist, and screenwriter. According to his website biography, he “has imparted the scientific outlook to literature”, and focused on working-class struggles and other contemporary issues. A few of his stories, translated into English, can be found here. 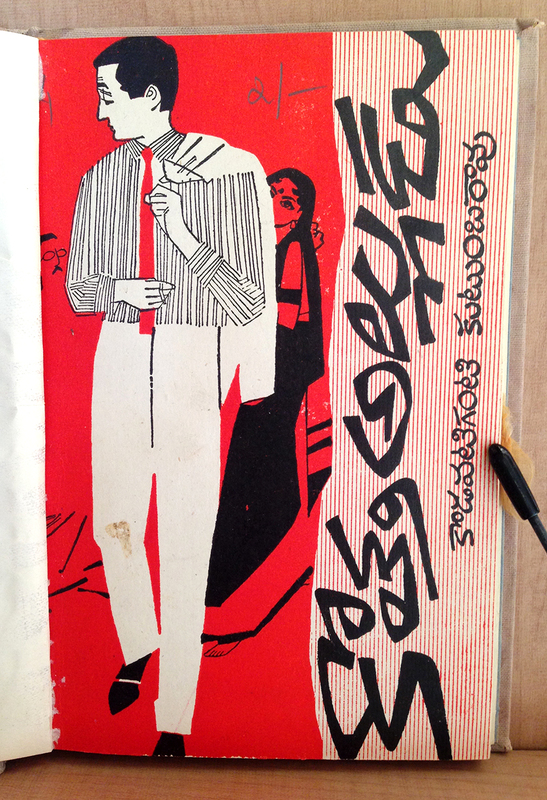 How fun, to see Telugu rotated like this, looking like a cool new East Asian vertically-written script. I love seeing lettering written in this sort of thick, assertive, playful style.